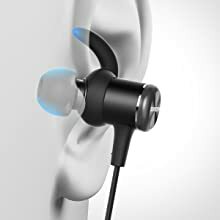 Bluetooth Headphones, Soundcore Spirit Sports Earbuds by Anker, Bluetooth 5.0, 8H Battery, IPX7 Waterproof, SweatGuard, Comfortable Wireless Headphones, Secure Fit for Running, Gym, Workout. IPX7 Sweat Guard Technology Truly sweat proof technology specially designed to resist the corrosive properties of sweat. Musical Motivation Crystal-clear sound is delivered through premium composite drivers. 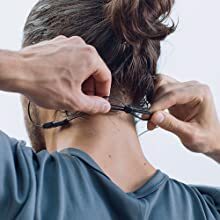 Ergonomic Design The cable clip keeps the neckband off your neck, while the specially designed Earwigs and Ear tip provide a secure, yet comfortable fit. 8-Hour Playtime Get a week of workouts from a single charge. What You Get Sound core Spirit, S/M/L/XL Ear tip, S/M/L Earwigs, 2 x Cable Clips, Shirt Clip, Micro USB Cable, Travel Pouch, our worry-free 18-month , and friendly customer service. Crystal-clear sound delivers music that motivates. The ergonomic EarTips and EarHooks hold Spirit firmly in place. 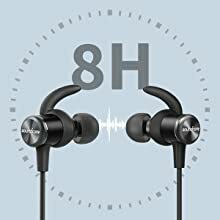 Get up to 8 hours of listening from a single charge. Instantly adjust Spirit’s cable to leave it floating comfortably behind your head. Anker PowerCore 10400, One of the Smallest and Lightest 10400 mAh External Batteries, Ultra-Compact, High-speed Charging Technology Power Bank. Remarkably Compact: One of the smallest and lightest 10400 mAh portable charger. Provides almost three-and-a-half iPhone 8 charges or two-and-a-half Galaxy S8 charges. High-speed-Charging Technology: Anker's exclusive PowerIQ and VoltageBoost combine to deliver the fastest possible charge for any device. Qualcomm Quick Charge not supported. Certified Safe: Anker's MultiProtect safety system and high-quality LG battery cells ensure complete protection for you and your devices. What You Get: Anker PowerCore 10400 portable charger, Micro USB cable, travel pouch, welcome guide, our worry-free 18-month warranty and friendly customer service.